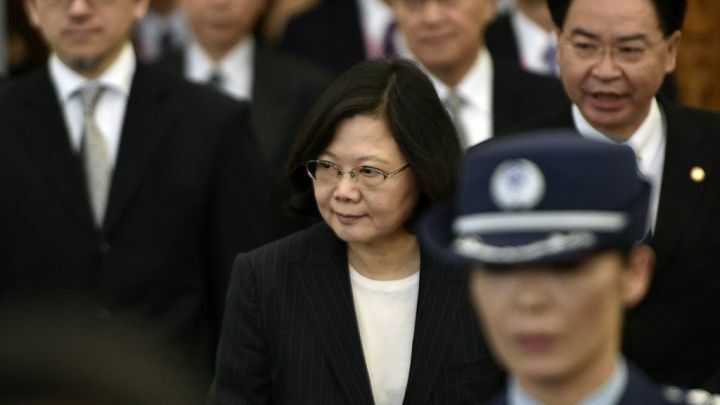 Taipei, November 26, 2018 – Chinese state media heaped pressure on Taiwan President Tsai Ing-wen on Monday after her ruling pro-independence party suffered heavy defeats in local elections at the weekend, as party officials sought to work out what went wrong. Tsai, who faces a presidential election in a little over a year, resigned on Saturday as chairwoman of the Democratic Progressive Party (DPP) after losing key battleground cities in mayoral polls to the China-friendly Kuomintang. The DPP now only controls six cities and counties to the Kuomintang’s 15. Han Kuo-yu, the Kuomintang’s mayor-elect in the southern port city of Kaohsiung, and the most high profile of the party’s winners, said he would open the door to contacts with China. Beijing has refused to deal with Tsai’s administration since she took office in 2016, accusing her of pushing for the island’s formal independence. That is a red line for China, which considers the democratic island sacred Chinese territory. Tsai has said she wants to maintain the status quo with China but will defend Taiwan’s security and democracy, especially in the face of ramped up Chinese pressure such as whittling down Taiwan’s dwindling band of diplomatic allies. In the run-up to the elections, Tsai had warned against Chinese efforts to interfere and urged that people must stand up for democracy. The official China Daily said in an editorial Tsai had ignored Beijing’s “cooperative stance” and forced relations into a deadlock, and that “her separatist stance has lost her the support of the people on the island”. Hung Mong-kai, a Kuomintang spokesman, said he was “certain” there would now be more interaction with China. Chiu Chui-cheng, deputy minister of Taiwan’s Mainland Affairs Council, told Reuters the government had always welcomed exchanges with China, but Beijing’s “political preconditions” had hindered such contacts. “We are always positive on city-to-city exchanges with mainland China, but it’s them who set a limit: they treat blue and green differently,” he said, referring to the colors representing the Kuomintang and DPP. Another state-run Chinese paper, the widely read tabloid the Global Times, said in an editorial that the DPP’s “radical thinking” had led it astray, though the same paper last week had called Tsai’s China policies “measured”. Close Tsai aide Chen Chu, secretary general of the presidential office, said there were “no excuses” for the poor performance and that they had to think deeply. “The one who really needs to change is me,” Tsai wrote on her Facebook page, adding that the administration would take a thorough look at major policies and personnel. She did not elaborate. Senior DPP member and legislator Lo Chih-cheng told Reuters the party had failed to please anyone with its moderate approach to both China and domestic issues, and the DPP needed a re-think and maybe a more radical agenda to reach its core supporters. “The party is in turmoil,” Lo said, suggesting one way to please people would be to try to win back some of the smaller countries with which China has ties. “We’ve been pushed into a corner, without fighting back. And that again disappointed our supporters,” he said. Still, Taiwan’s stock market .TWII was cheered by the Kuomintang’s gains, on expectations of better ties with China, closing up more than one percent. The Taiwan dollar TWD=TP also strengthened. China has done little to hide its glee at the DPP’s poor showing.